A team of students is partnering with a professor to offer naloxone training to third-year nursing students during their orientation. According to Canadian Students for Sensible Drug Policy, the downtown area around Ryerson is the centre of Toronto’s opioid epidemic. There were 308 opioid overdose deaths in the city last year, including accidental deaths and suicides, representing a 125 per cent increase since 2015. Naloxone, otherwise known by its brand name, Narcan, is a medication that reverses the effects of an opioid overdose. Toby Stevens-Guille, a fourth-year nursing student, is one of five team members who initiated the naloxone training pilot project. But, he said getting the initiative off the ground included overcoming some big obstacles. After the pitch was initially shut down, Stevens-Guille said the team was worried it might have to redo the project or abandon it all together. But, after reviewing nursing programs across the nation, Stevens-Guille couldn’t find any naloxone training for students and was eager to develop what could be the first program in Canada. “I’ve looked pretty extensively and haven’t found anything contrary,” he said. Stevens-Guille, along with team members Casey Wong, Michelle Aclan, Denzel Alabado, Hilary Tang, and Tiffany Louie, have pushed to make naloxone training mandatory during the nursing school’s orientation. Making naloxone training official curriculum, however, is another matter. Stevens-Guille said he didn’t really receive any help or support for the naloxone initiative until he met Corrine Hart, associate professor in the school of nursing. Over the summer, Hart and Stevens-Guille came up with a plan to incorporate naloxone training into the mandatory orientation for third-year nursing students, expanding its scope to 470 people. Pharmacist Samim Hasham also helped with the program. “It made perfect sense to try this because the students are placed in community agencies where there’s lots of discussion about naloxone,” said Hart. Many students are working with vulnerable people who might need naloxone administered, she added. With harm reduction at the forefront, Hart said that should naloxone training be added to the nursing school curriculum, it should be built on and supported by other learning criteria. “I think everybody should do it, and whether they do it in curriculum or not, that matters less. But if you’re going to do it as part of curriculum, it should be done thoughtfully,” she said. 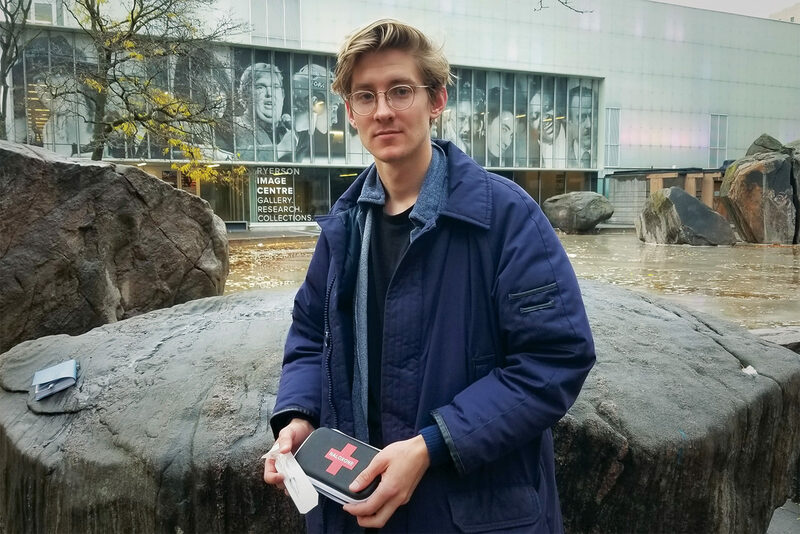 The next naloxone training session will be held in Ryerson’s Podium Building on Nov. 26, followed by another session in the the Tecumseh Auditorium on Nov. 27. Partnering groups for the event include the Canadian Nursing Students’ Association, the Nursing Course Union, the Canadian Students for Sensible Drug Policy and the Social Work Students’ Union.